In my life, angels have taught me the importance of just being with people, without expectation or judgement, writes Good Samaritan Sister Sarah Puls. Late in October when the bushfires were raging in the Blue Mountains and other areas of New South Wales, I had the privilege of being a Disaster Recovery Chaplain as part of the evacuation and recovery effort. I spent less than a week with the people as their lives were turned upside down by the fires which tore through their community. And in that time, I was moved and challenged by the resilience that I witnessed, but also the incredible capacity in the people I met to feel for others, especially for those who, in some way, were perceived to be in a worse situation. I couldn’t count how many people told me that they were “one of the lucky ones”. They were people whose houses were destroyed, but had insurance and felt for those who didn’t. They were people who had been able to save their pets and mourned with those who weren’t able to. They were people who had lost their home but had a friend to stay with and were concerned for anyone who didn’t. In those early days during and after the loss of homes and businesses, it was amazing to hear the outpouring of compassion and care from those in the community, and from people far and wide who wanted to do something to support those affected. From the experiences of people I know who were affected by the Black Saturday fires in Victoria, I know that the devastation is much broader than property loss. The recovery drags on interminably. I don’t imagine that feeling like you’re “one of the lucky ones” is something that comes without times of doubt and grief and anger. So I definitely don’t mean to imply that there is all grace and no heartache. As part of the team of Disaster Recovery Chaplains, my role was just to be with the people and help them to hold whatever it was they needed to hold – for some uncertainty, for others relief, for many a deep grief of all that had been lost. No one can take that away. But having someone beside you whose presence simply says: “I know you’re in pain… you’re not alone” can be enough to make it possible to hold it a little more gently. The need to know that we’re not alone is a universal thing. And it can be an intensely powerful thing too, especially where nothing else is possible. I often have the opportunity to spend an afternoon with people who are being held in immigration detention. For me, there are echoes across the two experiences – echoes that are profoundly unnerving if I really reflect on them. Because what they teach me is that, in the end, the gift that is given is not a thing, or even our skill – although sharing those matters a lot. But when I look deeper, what remains is just my capacity to sit alongside someone in pain and, in my own helplessness and frustration, continue to simply say “I’m with you”. Everyone understands these things in their own way, but for me, the experience in both situations is a very simple and very profound ministry of presence. I am, in most ways, helpless to change anything about the loss, grief, fear and heartache of the people I am with. I cannot un-burn a house and undo the loss, nor can I take away the experience of terror in the face of an enormous bushfire. I cannot change a situation of persecution to allow a person to return to their home country, nor can I free them from detention. For me, being effective in ministry with people who are experiencing pain, trauma and grief has made me very aware of the fundamental sacredness of the encounters I have each day. As I reflected on this, and remembered in prayer those I had been with, I was reminded of the letter to the Hebrews which recommends that we “not forget to show hospitality to strangers, for by so doing some people have shown hospitality to angels without knowing it” (Hebrews 13:2). Hospitality might be a cup of tea, a listening ear or a willingness to put aside my own concerns to really be present to the person who stands before me. In the evacuation centre my experience of being present for and with the ‘strangers’ I met led me to a deep awareness of their roles as angels in my life. I remember as a kid in primary school asking what an angel is and being told that an angel is a messenger from God. Looking back at that very simple explanation, I think it still is the best I know. Those angels might be someone who brings us news we need to hear, or wakes us to see a reality that is before us, or challenges us to continue on the path of truth. Being with the bushfire-affected people, and with those detained at Villawood Immigration Detention Centre, I am surprised by how often I am able to recognise, usually in hindsight, that I have been entertaining angels. In my life, angels have taught me the importance of just being with people, without expectation or judgement. They have taught me that the gift that I bring to their lives is not about doing but about being. And they have given me the chance to recognise the remarkable gift in my own life of having someone who can stand beside you in difficult times and simply say: “I know you’re in pain”, “you’re not alone” and “I’m with you”. Good Samaritan Sister Sarah Puls is a social worker. 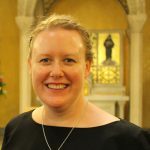 Until recently she was the casework team leader for Jesuit Refugee Service at Arrupe Place in Western Sydney, which provides a welcoming space for people seeking asylum and in need of essential services. She is also a member of ACRATH (Australian Catholic Religious Against Trafficking in Humans).